If you are interested in coming on our upcoming tour you can email us at info@cwebb.ca. Our tour fill quickly so make sure that you book your place soon on our next trip to bell'Italia! Italian-Canadian artist Christopher Webb and PAVIA Gallery ~ Espresso Bar & Cafe award winning CEO Victoria Foulger (see LinkedIn Profile - Here) lead the group through the eternal city of Roma and the set off to some of Italy’s most picturesque areas of Umbria & Tuscany. This unique tour will allow you to experience some of central Italy’s less traveled but monumentally gorgeous cities, towns and villages. Experience these magical lands from a passionate perspective. Amazing landscapes and locales. Unique dining. Even with our busy schedule there will be lots of time to wander off and enjoy a bit of time on your own. This exclusive tour, as always, will be limited to a maximum of 16 participants. SATURDAY, APRIL 25th, 2020: Whether you are arriving from Europe or an overnight flight from North American (or any other part of the world) let us be the first to say Benvenuto! After touching down in Rome (or arriving at Termini Train Station), you will make your way to our beautiful and historic hotel located in downtown Rome. 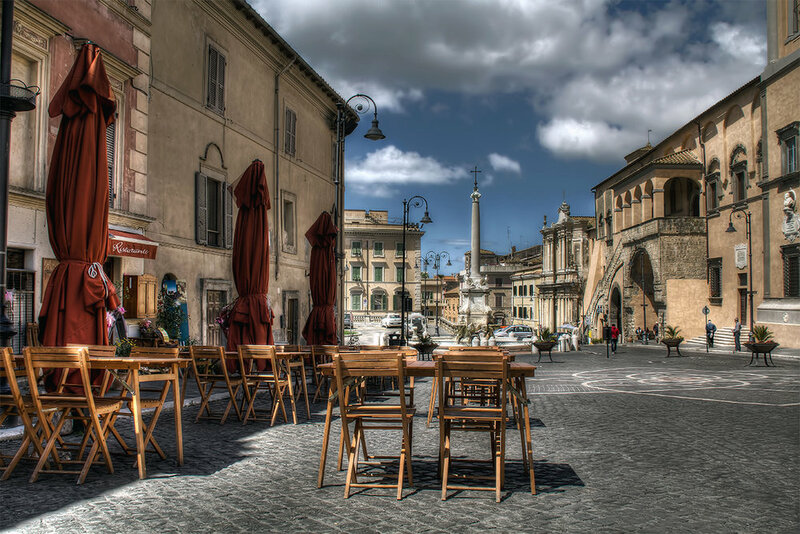 SUNDAY, APRIL 26th: How do you take in a city like Rome in just one day? Well, just follow Christopher & Victoria and you will cover more than 2000 years of history with a few coffee and gelato stops along the way. Trastevere will be our starting point, then across the oldest remaining foot-bridge in Rome, across the Tiber, through the Campo di Fiori, up the main street to the monument to Vittorio Emmanuelle II. To the left is Trajan’s Column and the Triano district. Straight ahead to the right is the Roman Forum (where, in fact all roads officially lead to!) Then we breeze by the Arch of Constantine and the Colosseum. Take a breath, because this is all before lunch! After continuing into the centre of Rome and seeing sights like the Pantheon and Trevi Fountain our late afternoon turns into evening. We meet for dinner and replenish calories. This is our busiest touring day of the tour. Rome wasn’t built in a day, but we covered as much as we could within that time frame! MONDAY, APRIL 27th: After a leisurely breakfast our driver picks us up at our hotel and we take a quick drive to one of our favourite towns, Tarquinia - possibly one of Italy’s most important Etruscan sites. We take a walking tour, visiting the famous Etruscan tombs and then, as we stroll down the hill, we meet one of town’s most important artists and stop for a quick lunch. In the early afternoon we drive directly to our Villa tucked away in the Tuscan landscape just south of Florence. One you are settled we will have a welcome glass of something local and then we sit down to a beautiful, locally inspired meal. .The second of our “tower towns” San Gimignano is one of the most famous small towns in all of Italy. THURSDAY, APRIL 30th: This morning we take our time to leave the Villa but when we do…the famed small town of San Gimignano. This walled, medieval hill-top town is known for its medieval architecture, unique in the preservation of about a dozen of its tower houses. We will have time for a little lunch and wander around. In the mid-afternoon we regroup at our Villa before heading out to dinner. And, although it is not one of our included meals, it is in one of the most wonderful restaurants in all of Italy. This generationally, tiny, family run spot is tucked away in the hills of the Chianti region. The Etruscan Academy Museum displays some of the most well-preserved artifacts in the country. We make the short drive to our final stop in Tuscany: the quintessential hilltop town of Cortona where we take our time to walk up and around the town. There are lots of places for lunch and lots of places to walk and explore. SATURDAY, MAY 2nd: It has been a destination for pilgrims around the world. Assisi is best known as the birthplace of St. Francis of Assisi — patron saint of Italy and founder of the Franciscan order. Assisi's main attraction is the 13th-century Basilica di San Francesco, which contains the sacred relics of Francis and beautiful frescoes of his life which are attributed to the Renaissance master Giotto. We then take a small detour to one of the less visited sites of Assisi: The Basilica of Santa Maria degli Angeli, which includes the Porziuncola, the most sacred place of the Franciscan Order. St. Francis of Assisi himself died here and the small, original church looks tiny in the middle of this gigantic place of worship! MONDAY, MAY 4th: Today we head to a beautiful place very close to our villa. We take the fanicula to the top of the town where there views are spectacular. Along with the historic sites, there are so many little shops to explore. It is a great example of what real life in Italy is all about. Stroll the streets or visit the Cathedral or civic museum. Continuing our day we drive the short distance and take the road less travelled to an organic olive oil farm and visit their 'Museo Dell'Olio'. This place is renowned for its organic olive oil, organic wines, jams, compotes, gelato and more. We will be given a tour of the museum and shown how they make olive oil, and all this is followed but an olive oil tasting and light lunch. Tour Departure Time (your arrival into Rome): The tour departs from our hotel in downtown Rome. Our coach driver picks us up at this hotel on Day 3 - Monday, April 27th and is not in a position to wait in the event that we are late. Regardless of the cause of the delay, it is the travellers responsibility to be at the meeting place at the hotel on this day.